This tutorial will review the process of installing a new module on your Drupal website. If the core Drupal installation is missing a functionality that you need, it is always possible to find a module that may provide just that. The best place to find Drupal modules is the official website of the script. It has a dedicated modules section that you can review for a module that will extend the functionality of your website the way you need. When you find one that you want to use on your website, make sure that you download the module for the Drupal version that you are running on your account. In our case, we have decided to download Views module for Drupal 7. 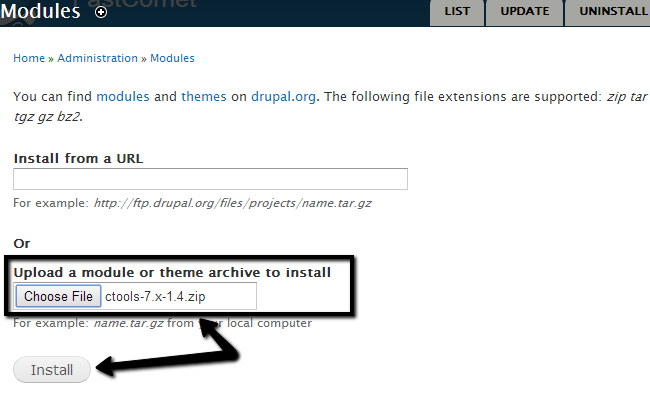 The download link for Drupal 7.x is available at the bottom of the page. Once you download the module on your local computer, you need to install it on your Drupal website. Then you need to log into your website as administrator and click on the Modules tab from the main menu. Click on the Install new module button at the top of the page. Install from a URL: You can simply enter the URL to the download page of the module. Upload a module or theme archive to install: Upload the downloaded archive of the module. You need to access the Modules tab from the main menu again and locate the new module/s on your website. Check the Enabled box next to the modules that you wish to enable.